Today was Alana Gomez Dong’s last day at KPRC…she’s heading to Boston. We wish her the best! I finally made it out to a going away party. Usually, I am sleeping when they are going on. Cafe Adobe, good times. Amanda used to work the morning shift; I still see her in the newsroom at times typing away. Tanya works the 10, so it’s great when we have functions like this b/c we get to mingle with co-workers from different day shifts. Mia, great producer for our morning show! Erica gets the 6 going everyday and I found out that she enjoys putting on functions like this. Fits her personality. Amy…well, you all are used to seeing her get down to business with the investigative team. Here, she’s all smiles. For the record, Phil Archer does not have a double chin. Let’s blame it on lighting…ok the photographer…how about his sheer joy? Alright, who took this picture again? They said, “yeah Jen you REALLY need to squeeze in….tighter….” HUH? I had plenty of room. Just making me cramp Alana. Brian Wice, our legal analyst – back on board with KPRC. James, one of the nicest photographers in the business. Mary was snapping away with photos. Check out her Facebook Page and her blog. I have the BEST job and am so thankful for it!! Jennifer Reyna interviewing micro sculptor, Willard Wigan. Right before Santa Claus parachuted from a plane…Frank and I were hanging out reading over scripts and saying hello to everyone. By the way, if you took a picture with Frank or me, you will be able to find those pictures on click2houston.com by the end of this week. I’ll post the link here. Jen and Louis Lochte(field producer) working in the live truck. This Saturday will mark my first visit to The Festival Of Lights. It sounds awesome! I’ll be in the middle of Moody Gardens as Santa Claus makes an early visit to flip the switch…ta-da…ONE MILLION LIGHTS! May the holiday season begin. JUST FOR FUN: To shed more light on your Channel 2, Traffic Anchor’s background try taking a shot at this quiz question. The answer will be posted here on Monday. ANSWER: B – Dad would take me ice skating on a regular basis. I met some wonderful people while on this story. Tyrina Gleinser, my photographer and I took a trip up to Conroe to see what all of the hype was about…HUNDREDS of fathers were pumped up and ready to make a positive impact on the lives of children around them. Take a look at the story. Then spread the word to as many dads as possible. Here’s a link to the WatchD.O.G.S website in case you want more information on how to get involved. My alarm goes off around 3AM. Once I get to work, I touch up for camera, put on my mic and IFB set and start on a bowl of fruit. There’s usually some combo of banana, kiwi, blueberries, strawberries, apple or oranges. Obviously, any fruit will do. Then it’s off to the set at 5:01AM. And as I “standby”…this is what I see…robotic camera #1, Anthony Yanez forecasting the weather and a floor director (he’s missing from this picture). My view right before I go on LIVE. And when I look to my left, I can see this monitor. There is another to my right. If those are ever off, it’s like doing traffic with my eyes closed. It’s possible, just not ideal. Matt, our robotic operator is taking his seat-in the distance. I have two side monitors (this is one), so that I can see what you see on tv. Work has begun on the first of two projects on US 290. The project consists of widening the existing pavement to add extra lanes on the US 290 eastbound and westbound mainlanes between West Little York and Fairbanks N. Houston, as well as re-striping the existing pavement to add additional lanes along the US 290 eastbound and westbound mainlanes between Jones Road and FM 529. Crews will also widen the westbound approach to Senate Avenue to create combined u-turn and left-turn storage at the intersection. Once complete, the extra lanes will alleviate traffic congestion by providing motorists with improved access to/from the US 290 mainlanes. Crews began installing barricades and signing; work on the US 290 mainlanes is anticipated to begin in the coming weeks. Work on the proposed improvements is anticipated to take approximately 6 months to complete. 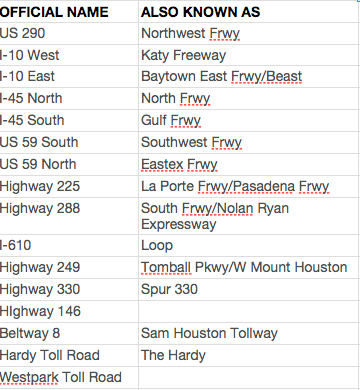 Motorists are advised to anticipate temporary lane reductions on the US 290 westbound frontage road to accommodate the intersection improvements, as well as extended shoulder closures and nightly mainlane closures along the US 290 eastbound and westbound mainlanes. Though independent of the reconstruction planned as a part of the US 290/Hempstead Corridor Program, these projects are important first steps in providing immediate relief to the traffic congestion on the Northwest Freeway.